Our "From a Space to a Place" (FASTAP) students from Agape Development's Youth Council have been working hard with us to bring their vision of a vibrant, poetic mural to life. 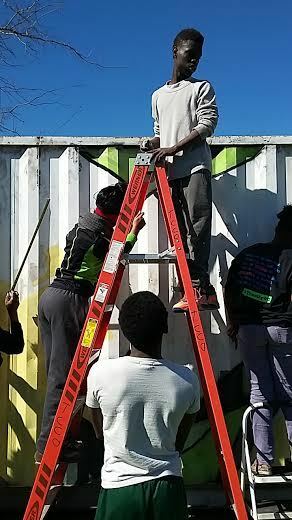 After exploring and identifying the needs of their community, brainstorming positive solutions, and developing project management skills to fulfill their vision, the students are in the process of successfully transforming an empty space into a vibrant place with the creation of a colorful mural featuring their original poetry. Under the guidance of Noel Bezette-Flores, the teens wrote six powerful poems, aiming to inspire their community members to show love and kindness to one another and avoid violence. They then designed a to-scale digital blueprint of their mural with the guidance of guest artists and educators, Marjon Aucoin and Dandee Warhol. Over the past two Saturdays, the students have made amazing progress in their endeavor, working as a team to make their collective dream come true. In addition to painting their mural, the students are also using their newly acquired project management skills to plan a "Hug the Hood" Block Party for their community. During this celebratory event, the teens will share their creative journey and hard work with the members of their community, while providing refreshments and entertainment. The mural will be completed next Saturday, February 6th, and will be unveiled to the public during the Block Party on Saturday, February 20th. We are also excited to announce that we will continue to work with these students over the next few months during the pilot of FASTAP Phase Two. On January 15th, we celebrated the unveiling of the colorfully inspiring park envisioned and created by the students of Marshall Middle School during our first “From a Space to a Place” pilot program last summer. 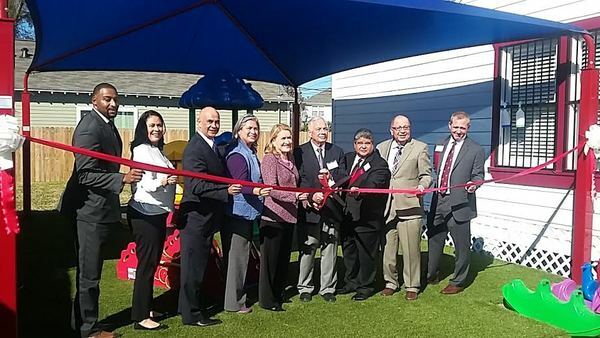 Located at the newly opened AVANCE Northside Early Head Start center (1209 James St.), this vibrant park provides a place for anyone in the community to go and have a good time. The patio offers itself as a place of reflection and encouragement, complete with hand-painted benches, bricks embellished with positive messages, and newly-planted trees. 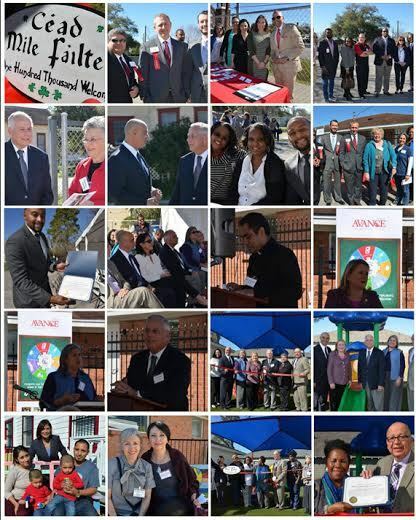 This successful partnership between TFAA, AVANCE-Houston, Avenue CDC, GO Neighborhoods Northside and Marshall Middle School even caught the attention of Texas State officials, including Congressman Gene Green, Congresswoman Sheila Jackson Lee, State Representative Jessica Farrar and Senator Sylvia Garcia. Thank you to the participating students of Marshall Middle School, and thank you to all our partners and volunteers who helped bring the vision of the youth to life! 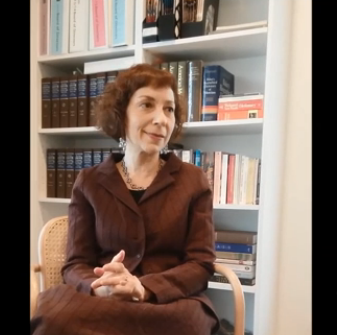 Please enjoy an interview with Sarah Rothenberg, the Artistic & Creative Director of Da Camera, in anticipation of her upcoming Marcel Proust Project. "A Proust Sonata" premieres Thursday, February 11th and Friday, February 12th at 8:00 p.m. at Cullen Theater, Wortham Theater Center. This spring, we are preparing for the fall launch of "From a Space to a Place" in Paris, France. We have been hard at work securing partnerships and assembling a team of French educators to facilitate the program and ensure its success. Since starting our creative workshops at Texas Children's Hospital, we have accumulated many amazing drawings, ideas, and memories from the participating children. Their imaginative visions and creations will inspire artists Sebastien Boileau, Marjon Aucoin, and Karine Parker in the design of the mural, which will be located in the valet drop-off area of the Clinical Care Center. TFAA is excited to be partnering with FotoFest International for FotoFun 2016, a family-friendly fundraiser in support of FotoFest's Literacy Through Photography school and community-based education program. Staying true to the FotoFest 2016 Biennial theme, "CHANGING CIRCUMSTANCES: Looking at the Future of the Planet," we will collaborate with Literacy Through Photography to create a fun, environmentally conscious activity for children and their families. Each year in March, the Cultural Service of the French Embassy in Houston coordinates the French Cultures Festival (FCF) in Texas, Oklahoma, and Arkansas. This celebration of the diversity of "la Francophonie" brings together people who not only speak French, but also feel, in one way or another, connected to French cultures and the Francophone community. The FCF gathers many institutional partners, from diplomatic representations, museums, universities, schools and other organizations. Last year, over 30 cultural and educational events were showcased during the Festival in the three states covered by the Cultural Service.